Christine Hale's evocation of the bewildering complexities of life as a mother, daughter, wife (and ex-wife), and student of Buddhism is both a poem and a letter to those she has worked so long and hard to understand. On a journey that takes her through emotional and actual hurricanes, love and cruelty, urgent losses, and painful gains, she climbs to sometimes unnervingly high altitudes as she experiences "the joy and the sorrow of samsara." In beautiful, clear language, Hale explores the wounds life gives us, the wounds we give ourselves, and the long process of healing. When St. John of the Cross first penned Dark Night of the Soulin the 16th century, he clarified the halting and stumbling steps of a spiritual journey. 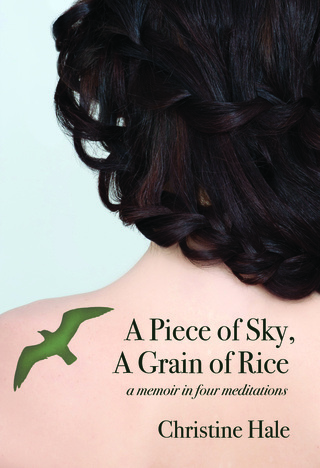 Christine Hale's A Piece of Sky, A Grain of Rice takes this classic form and brings it into the 21st century, looking through the lens of loss, childhood trauma, Buddhism, and natural disasters, with tattoos and the author's love for her children front and center. Her narrative illuminates the experience of stepping through the chilly and often frightening darkness into a hoped-for new dawn in the company of a generous friend and trusty guide who's one step ahead.